Massed formations of infantry soldiers carrying polearms was a common sight on the battlefields of Europe from the medieval period right through to the early 1700's. The fighting part of the polearm was placed on the end of a long shaft and they were specially designed to disable and inflict crushing injuries upon knights. Cheap to produce in large numbers and versatile on the battlefield, these weapons became the mainstay of the European medieval foot-soldier when engaged in close combat. A particularly brutal polearm used extensively in medieval and Renaissance Europe, the bardiche found particular favor in eastern Europe and Russia. Blade design varied considerably from country to country, but the main characteristic was a substantial cleaver- type blade and attachment to the pole by means of two widely spaced sockets. Blade length was around 60cm (23.6in), although the haft was unusually short at approximately l.5m (4.9ft). This weapon appeared top-heavy and impractical, but the bardiche was regarded more as a heavy axe and wielded accordingly. With a tradition going back to the Viking Age, the bill is commonly regarded as the national weapon of the English both during and beyond the medieval period, although it was used elsewhere in Europe, particularly Italy. As with many polearms, the bill developed from an agricultural tool, the billhook, and displayed a hooked chopping blade with several protruding spikes, including a pronounced spike at the top of the haft, resembling a spearhead. The bill also had a strong hook for dismounting cavalry. Used skillfully, it could snag onto any loose clothing or armor and wrench the target from his horse and throw him to the ground. English bills tended to be shorter with the emphasis more on the chopping action of the blade, while Italian bills had a very long spiked end, resulting in its use as a thrusting weapon. 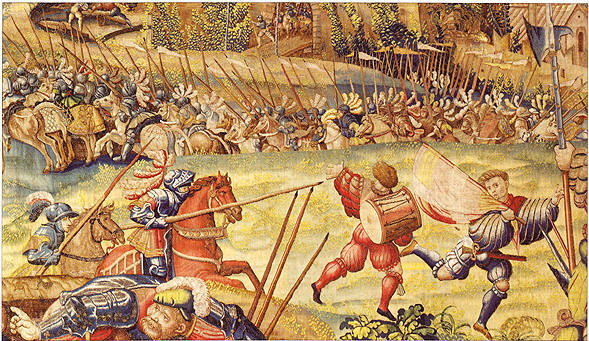 ABOVE: The battle of Pavia, 1525, between the Holy Roman Emperor Charles V and Francis I of France. Note the pikes and halberds (right). Similar in design to the Japanese naginata, the glaive originated in France, and its single-edged blade was attached to the haft by means of a socket shaft. Blade length was typically around 55cm (21.6in), with a wooden pole l.8—2.lm (5.9—6.8ft) long. Medieval Swedish infantry adapted the glaive by fixing a double-edged sword blade to the haft. 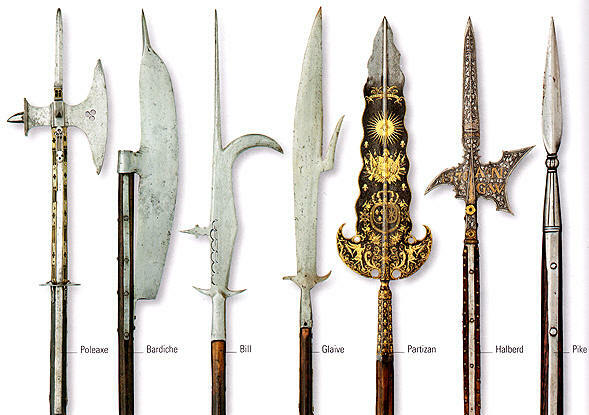 Glaives with small hooks are known as “glaive-guisarmes”. The halberd is a crude, rectangular blade, shaped to a point at the top; the earliest known use of the halberd comes from an excavated example from the battlefield at Morgarten (1315) in Switzerland. The word “halberd” originated from the German haim (staff) and barte (axe). Over time, the halberd’s spear point was improved to allow it to be used to repel oncoming horsemen. The haft of the halberd was also reinforced with thick metal rims, making it more effective and durable when blocking blows from an enemy sword or axe. Smaller than normal polearms at 1.8—2m (5.9—6.6ft), the partizan was constructed from a spearhead or lancehead, with an added double axehead at the bottom of the blade. It proved not to be as effective as other polearms and it was gradually withdrawn from frontline use. It remained as a ceremonial weapon and many have elaborately decorated blades. Partizans were carried right through to the Napoleonic Wars (1804—15). A ubiquitous battlefield weapon during the medieval period, the pike was simply a very long, thrusting spear employed by infantry as both a static defensive weapon against cavalry attacks and as an attacking polearm, when used in massed ranks and close formation. The combined length of both haft and head rose over time to a staggering 3—4m (9.8—13.lft), sometimes even 6m (19.6ft), and it was this very length that was both its strength and also its inherent weakness. The pikeman could stand at a relatively safe distance from close combat, but the weapon’s unwieldiness could also prove dangerous for him. A pikeman was armed with sword, mace or dagger in case his pike was lost in battle.